The first time that I was stopped by the carabinieri was when I was a tour guide for an extremely brief period in 1999. I can remember being totally freaked out by the experience, and I can’t even remember whether I managed to produce the relevant documents that he wanted to look at. I don’t think I did. The reason I think this is because of when I was stopped by the carabinieri the second time many years later. This time I was equally freaked out particularly since he threatened to take away my Australian driving licence. You see I hadn’t investigated things properly and hadn’t realised that I actually needed an international driving licence to go with my Australian one to continue driving. And that really as a foreigner intending to live in Italy full time I really did need to get an Italian driving licence. Due to the fact that I am not from an EU country, I have had to start from square one. Never in my wildest dreams did I imagine that I would have to re-sit a driving test. So I started the drama that was attempting to get my Italian driving licence. You see I still haven’t got past the theory part of it. It was one great hurdle. The first two times I tried to do the test I made lots of errors. The third time that I sat the test I made only 5 errors, and you are only allowed 4. That did it for me. Then I went right off studying the 200+ page book in Italian given that in my area you can’t seem to find the book in English. They have even made it more difficult as the test is 10 questions longer and you can still only get 4 wrong. And the test is only in Italian. No more advantages to foreigners. When I dissolved into tears after the third time, the woman behind the desk didn’t show much sympathy. She said well once upon a time we let stranieri (foreigners) answer the questions orally. Not so now, and it didn’t help that I saw so many traffic infractions on the way to and from my theory test. It seems that as soon as you get your licence all the rules get ignored completely. Plus drivers often break the speed limit, gesticulate and honk their horns if people dare get in the way. My son came up with a solution. I need to get an Ape. I can just see myself arriving to do the supermarket shopping in my Ape. 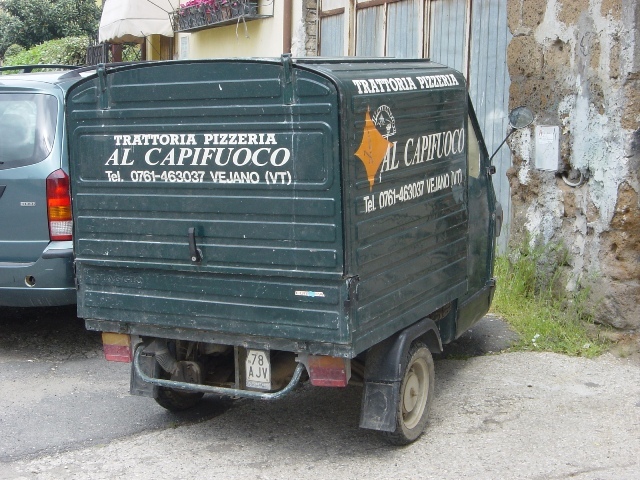 I never did get my Italian driving licence. We moved to the UK and it was a fairly painless process to have my Australian licence converted into an English one.